Only a few companies in the world actually build concert grand pedal harps. Over the course of several months, harp builders hand fit over 2000 moving parts. Once the harp leaves the factory, a select group of harp technicians travel the world to maintain these instruments. Unfortunately, harpists do not usually have the opportunity to bring their harp to their local harp shop for routine maintenance or repairs for more significant problems...especially in Boone, NC, a mountain town with a population of approximately 17,000. As you may know, a pedal harp has seven pedals around the bottom of the instrument. We use these to change keys and handle accidentals. Three months ago, while practicing a piece by Bach, two of my pedals froze! Attempting to move a pedal from the flat position to the natural position, I heard a metallic click, and the pedal refused to move into the natural position. My harp was inoperable and I was due to perform in Wilkesboro, NC for Palm Sunday just a few days away. What to do? I called the harp maker, Lyon and Healy in Chicago, IL who located the nearest harp technician 300 miles from my home in Boone, in Charlottesville, VA. Upon phoning the traveling harp tech, he agreed to meet in Charlotte, NC (only 100 miles away!) where he would be working on a harp in the afternoon. Whew! Perhaps it could be fixed right away. He flipped the harp onto its column, removed the base and examined the interior. After a several minutes of inspection, he determined a rivet had inexplicably loosened in the neck of the harp on the mechanism, which blocked the pedal action. 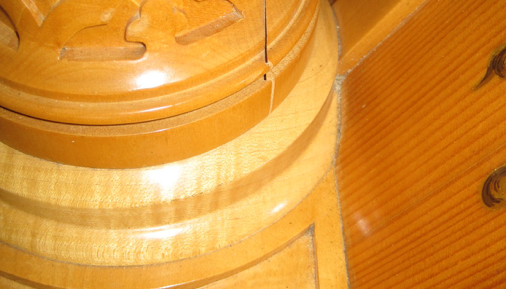 To make the appropriate repairs, the neck of the harp must be pulled apart to access the interior mechanism. My harp needed to return to the harp factory in Chicago where it was built in 1991 and I still needed an instrument for Palm Sunday! Being a harpist, is a bit like having membership to a sorority/fraternity. Gratefully, I was able to borrow an instrument for the morning from my friend and fellow-harpist in Hickory, NC. A harp can be shipped safely in a truck with a hard trunk, when the weather is between 32F and 90F. It snows frequently in the mountains, even in the spring. My instrument could not be picked up by the shippers until April 1 when the temperatures rose to a safe level. At the factory in Chicago, harp technicians examined my instrument and confirmed the previous diagnosis. My instrument required new rivets. Additionally, sometime during the life of my harp it fell over, TWICE! It fell both times without my knowledge. The column, I learned, was misaligned with the base of the instrument, putting additional stress on the frame of the harp. The instrument incurs 2000 pounds of pressure from the strings and that tension was on the wrong spots. The above image shows a crack in the base of the column, signifying the issue. My harp will be sent back to Boone in early July, nearly four months after the rivet popped out for a happy reunion. For now, I am gigging and practicing on a lovely walnut harp from Greenville, SC.